Still, it’s sunny and warm and Dublin’s streets are packed with people, buses, and peddlers. The lovely Catherine and I are there, too, walking along its central artery, the River Liffey, near the pub-lined Temple Bar neighborhood. We’re in Ireland to visit Catherine’s brother, their Irish cousins, and every Guinness-pouring pub I stumble onto between Dublin and Dingle. Soon our daughter (and my editor) Gracie and her husband, Andrew, will join us in Cork to visit the rugged southern and western coast. Since our last visit in 2008, Dublin seems to have gone global. Our hotel clerk is Latvian, our dinner waitress Brazilian, the restaurant cashier Chinese. We don’t hear a word of Gaelic anywhere. Likewise, Cork, a small university city two hours southwest of Dublin, is more cosmopolitan than any American city its size. We arrive on a mid-Sunday train and Bill, Catherine’s youngest brother, greets us like a local and drives us to a pub for some cold pints and warm “craic,” or fun. Gracie and Andrew arrive the next day with a grand itinerary and beautifully grand—grand is Ireland’s favorite adjective—summer weather. Our first stop is Ballymaloe Cookery School and its adjoining organic farm and gardens. Catherine and Gracie revere one of its founders, Darina Allen, the “Julia Child of Ireland,” for her cookbooks and slow food advocacy. But Ballymaloe is more: Darina and brother Rory started the school in 1983; her in-laws transformed their manor house into a restaurant in 1964 and, later, a hotel, too; son Toby greets guests in the gift shop; and husband Tim manages the farm and livestock enterprises. Dinner that night in coastal Crookhaven is equally late, equally grand, and unequal in craic. A foamy visit to the village’s only pub, O’Sullivan’s, follows and brother-in-law Bill introduces me to John and Jackie, a husband and wife dairying team with 50 grass-fed Friesians. Next, for us, means four sunny days on County Kerry’s broad, blue Dingle Bay. Our rental house has everything, including bleating lambs and ever-listening ewes on thousands of acres of steep mountain pasture out our backdoor. 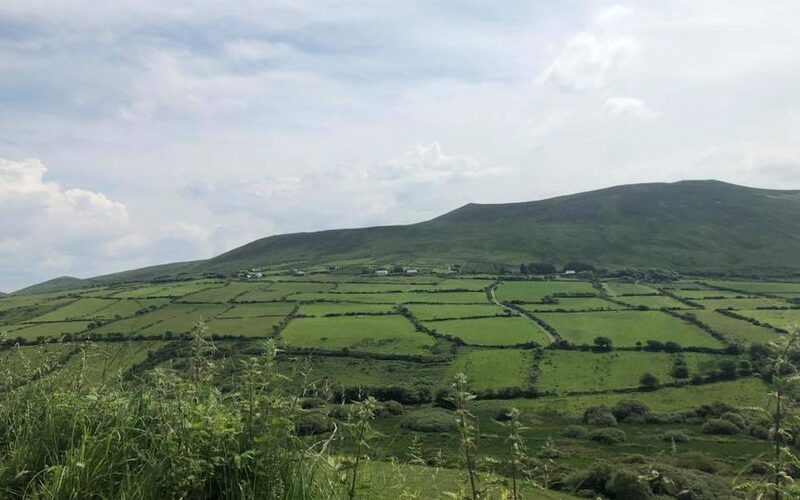 We day-trip around Kerry, visit locals on rural walks, and enjoy Catherine, Gracie, and Bill’s cooking. Too soon, though, we’re off to visit Catherine’s cousins, P.J. and Bridie, horse farmers in County Roscommon. When we arrive, however, we find only Bridie; 81-year-old P.J. has taken a “pony”—they breed sought-after Connemaras—to a nearby show. The next day, the lovely Catherine and I return to the U.S. while Gracie and Andrew side-trip to London. A young American banker seated next to me on the plane notes that we visited Ireland during the best stretch of weather he had seen in three years of living there. The weather holds until we slide into our Illinois bed 20 hours after rising in Dublin. An hour later, a blistering thunderstorm strikes and drops three inches of rain in an hour.